renowned pastor and motivational speaker, DeVon Franklin delivers a fun and engaging children’s sermondiscussing the themes of the film and keeping the spirit of this inspiring story alive in us every day. 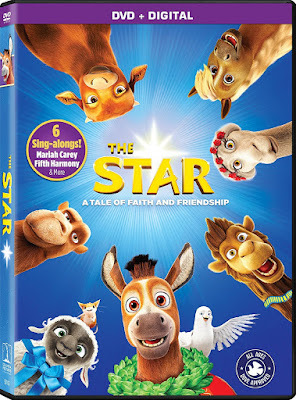 The Star is an adorable movie about a little donkey who longs for more from life. One day he manages to break free from the mill where he works. He makes a lot of friends on his journey including a little sheep, a few camels, and a dove. Along the way they find themselves part of a magical story that everyone will be familiar with. It was a great twist that I wasn't expecting. This is such a beautiful and uplifting film. My children loved all the animals, and the songs are wonderful. There is original music written by Mariah Carey, and lots of other celebrity voices, including Oprah Winfrey and Tyler Perry. The DVD also includes some wonderful bonus footage including a dance along and crafts. This is a great film for family movie night that will inspire any household.